John J. Pettus of Mississippi. Does anyone know of another picture of him? This one is lame. ABOUT MUNITIONS OF WAR AND TAXATION. The Yazoo (Miss.) Banner reports Gov. 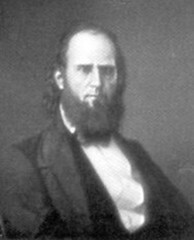 PETTUS as having said, upon the streets of Yazoo City, that he had not only drawn from the State Treasury the two hundred thousand dollars appropriated by the last Legislature to purchase arms and ammunition, but he had ordered more than they could purchase, giving his receipts as Governor of the State, for the amount overdrawn. This entry was posted in Georgia, John J. Pettus, Mississippi, Secession. Bookmark the permalink.